Emsisoft Anti-Malware is an advanced protection solution against malicious objects (ransomware, backdoors, bots, trojans) and potentially unwanted programs commonly known as PUPs. 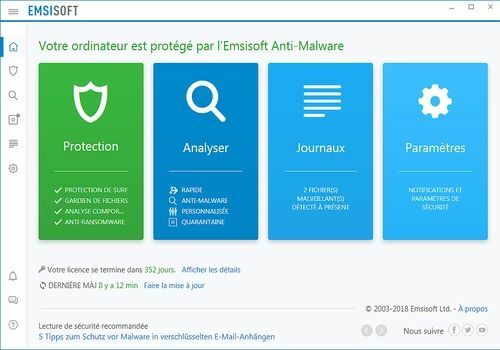 Emsisoft Anti-Malware uses two high-performance scanning engines. The first is responsible for identifying common threats and the second is responsible for PUPs. It should be noted that one of these engines is the one of BitDefender, which Emsisoft has decided to complete with an engine developed by itself. The software can completely replace your antivirus since it includes real-time protection features as well as web protection. The real difference between Anti-malware and Internet Security, the publisher's other flagship program, is the firewall protection that secures your machine when you are on a public network for example. Are you sure you can turn on your computer safely? Try the combined power of Active Shield and True Sword in the Stronghold Security Suite.